Session 424. Sandy Point delivers again - what a fantastic location for kitesurfing! I got to the beach around 4 p.m. with the wind building. There were a couple of other kiters out and 3 windsurfers were enjoying the waves too. With my 10m kite being repaired, I was lucky that the wind was good for my 8m. I had plenty of power to get out and and around and not too much for surfing in. 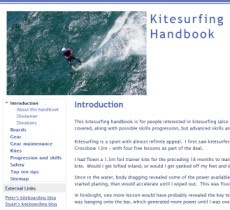 The Sandy Point surf is excellent for kitesurfing - the waves don't close out so its easy to get out the back. You can score some nice rides coming back in. There is heaps of beach and its not crowded. If you haven't been there its well worth a visit.